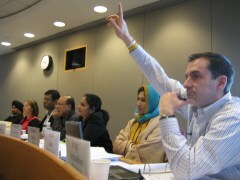 Your last chance is fast approaching to apply for the 2011 HBS-ACCION Program on Strategic Leadership for Microfinance, which will take place April 25–30th at the Harvard Business School campus in Boston. The program is tailored to meet the needs of executives of institutions ranging from MFIs to private-sector commercial banks and service providers. In addition, this year we invite investors and regulators engaged in expanding financial inclusion to apply. Read more about the 2011 program and download an application here. Spaces are filling up fast. To apply, please email us your application no later than Friday, February 4th.